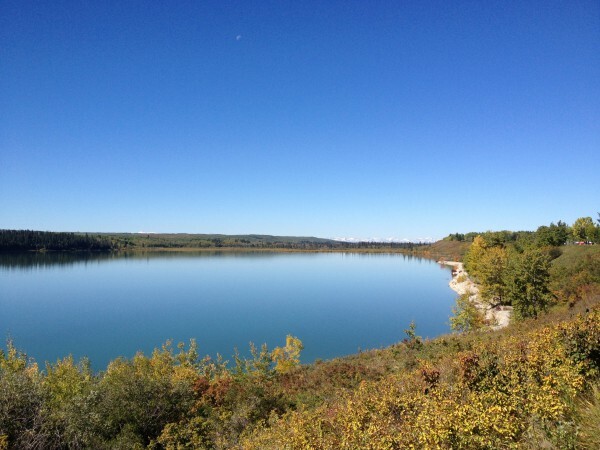 J and I drove by the Glenmore Reservoir a couple of weeks ago on our way to Chinook Centre. We needed a few things for our kitchen and bathroom. 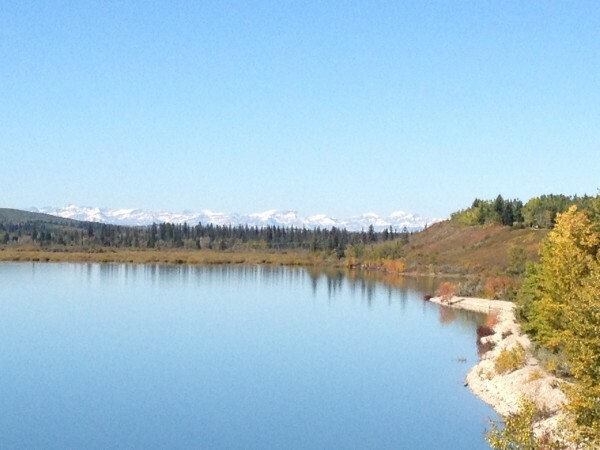 The large body of water, with the snow covered Rockies in the background, looked pretty spectacular. So I looked it up on Google Maps when we got back home. And I saw the picture below. Pretty nice! You can see a larger version here. I don’t think the birds are Snow Geese though, at least not most of them. The most noticeable birds look like Tundra or Trumpeter Swans. 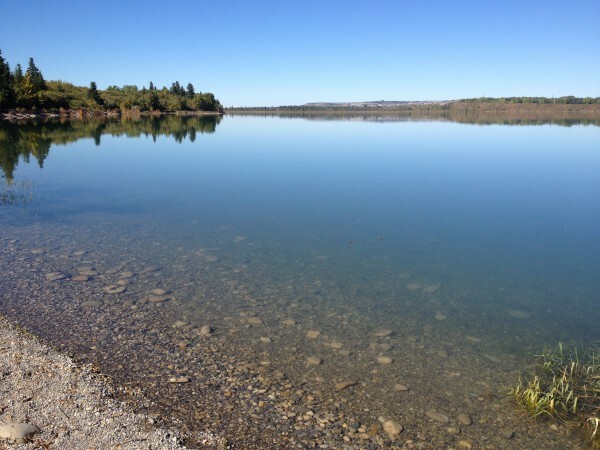 I didn’t walk to the Glenmore Reservoir since it is more than a 30 minute walk from my home. 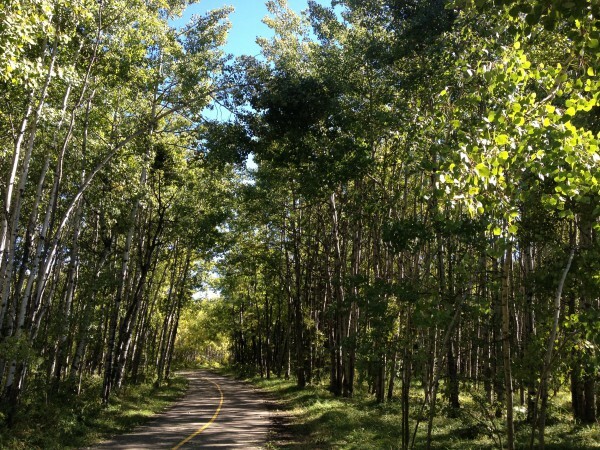 I don’t ride my bike much; however, since I’ve moved to Calgary, I’ve noticed a lot of paved paths reserved for cyclists and have been looking forward to trying them out. I rode 20 St SW toward the park. It doesn’t have a reserved bike lane but it is very bike friendly (smooth pavement, not much traffic, easy to cross intersecting streets, nice views). The bike path around the reservoir is awesome! 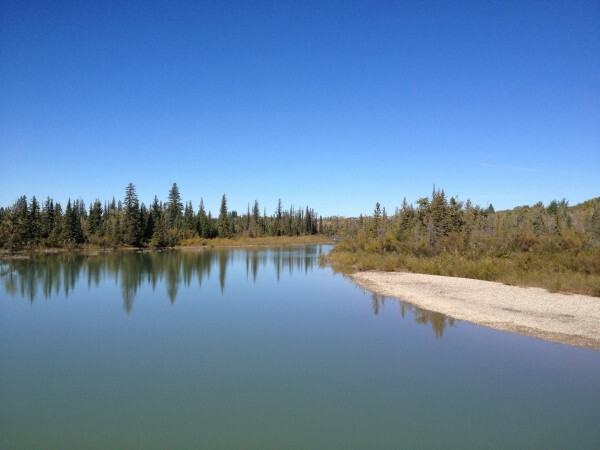 There is a small section on the southwest side, after the bridge, which is unpaved. But the rest of the path is paved and the scenery is bee-oo-ti-ful! 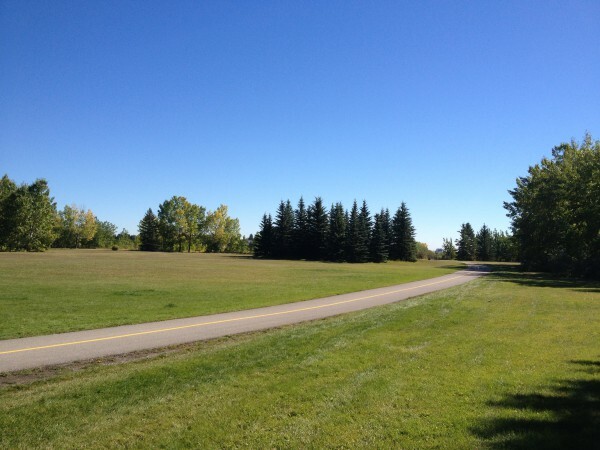 This is a picture of the bike path near Crowchild Trail SW, where I came into the park. There is a similar path reserved for pedestrians a few feet closer to the water. 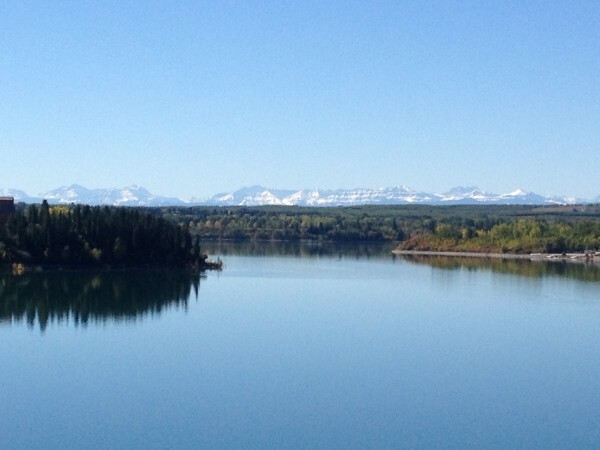 On the north side of the Glenmore Reservoir, looking west toward the Rockies. The half moon is visible in the sky. Zoom in view of the Rockies. View of pedestrian/cyclist bridge that links north and south of reservoir (look under electric wire, it has turquoise railings). 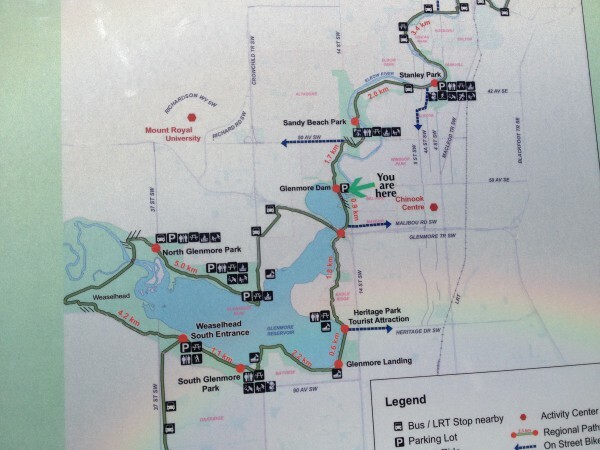 The bike path on the southwest side of the reservoir is a bit wilder. There are no wide expanses of manicured grass; instead the path is flanked by forests of small aspen trees. 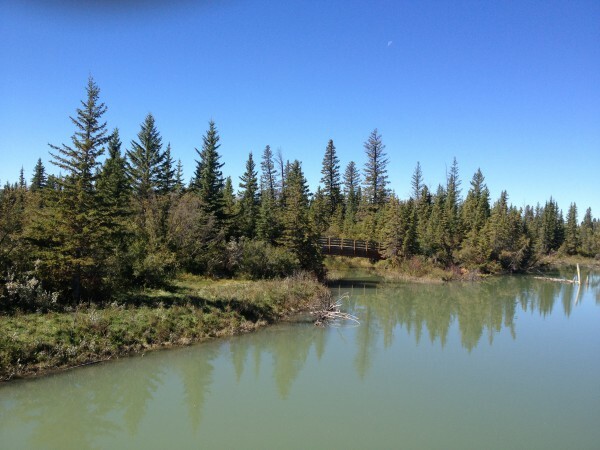 This is Weaselhead Flats Park, which joins the North and the South Glenmore Parks. A map of the reservoir near the Sailing Club (on south side of reservoir). Looks like it got hit by a hail storm. Near Sailing Club, view of reservoir looking west. On bike path by Holy Cross Ambulatory Care Centre, looking southwest. 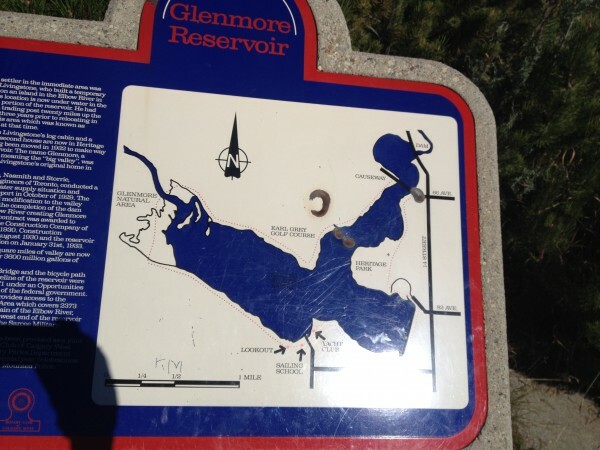 A little further down the path, I walked my bike over the Glenmore Dam, which I thought was a neat way to cross the Elbow River. There was a map on the other side. I rode my bike on 14 St SW to get home. 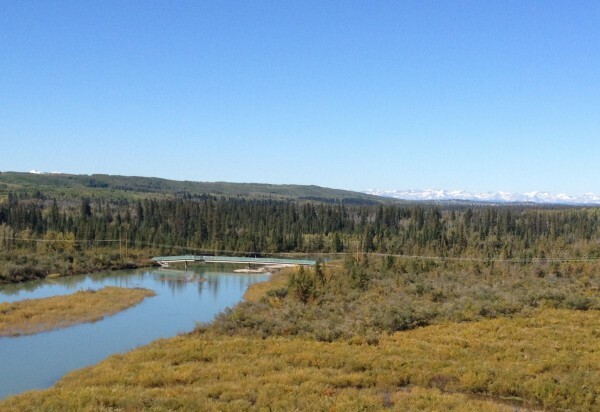 It is bordered by River Park on the right for about 1.3 km. I checked out River Park before “Snowtember” hit. It is a short-ish walk from Phil & Sebastian on 33 Ave SW.